Breaking any bone is painful and with a Jones fracture sudden pain may be felt at the base of the 5th metatarsal or the long bone from your little toe to the middle area of your foot. There will be tenderness at the point of injury on the outside of the foot. The athlete will be unable to bear weight on the foot and a deformity is sometimes present. Jones fractures are often caused by turning the ankle over so the foot faces inwards and the foot points downwards (inversion). It may also be the result of overuse – especially repetitive impact on the outer foot. This fracture is often mistaken as an ankle sprain because of its location. 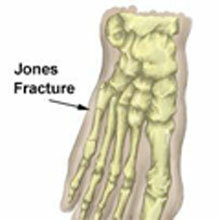 Jones fractures are identified with diagnostic X-rays. Initial treatment usually means the patient will have to wear a cast for 6-8 weeks to immobilize the foot and prevent weight-bearing activity. If the fracture fails to heal then surgery to place plates and screws in the foot can be undertaken. Often Surgeons will prefer to place a screw in the bones to hold them in place immediately rather than wait. Return to sport is shown to be quicker with this method of surgery (around 2 to 4 weeks) following an immediate fixation by putting a screw. However, this does make it more likely the individual to re-fracture the bone. The time is taken to return to full training after a surgical fixation operation is around 8 weeks, although it is recommended for full healing to be seen on a radiographic image before full training is resumed.